In 2011, I brought my very first exhibit to the Bay Area Maker Faire. I had a great time showing off my homemade props, and especially my HALO Spartan costumes. The following year I expanded the exhibit a bit to include some Warhammer 40k Space Marines. Both years I had an absolute blast. Then last year I decided to take it easy. I didn’t build anything new and huge. Instead I dusted off a few more things to add to the display I’d been showing all along. As it turns out, that was no fun at all. I’ll see your armored supersoldiers and raise you one giant murderbot. 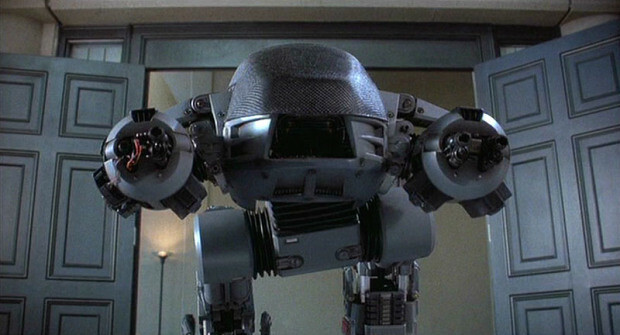 This is the Enforcement Droid, Series 209, the killer bad-guy robot from the original Robocop movie. If you haven’t been keeping up, be sure to look at the previous articles in the series, where I explain deciding on the scale and knocking together some of the prototype parts, building fiberglass molds to replicate large parts, making silicone rubber molds to cast small detail parts in urethane resin, and the vacforming process I use to form thin, lighweight parts from sheets of plastic. 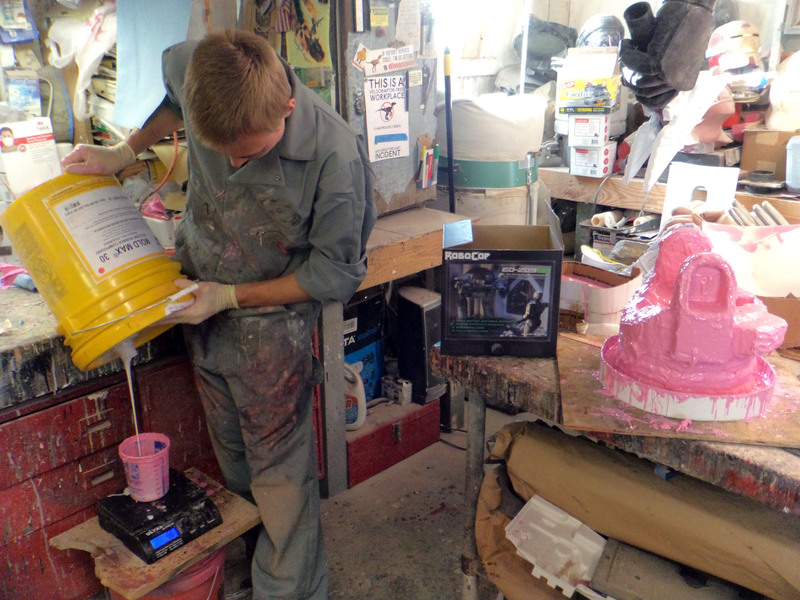 Rotocasting, also called “slush casting,” is a method that allows you to make hollow resin castings in a silicone rubber mold. If you’ve watched the video above you should have a pretty good idea of how it goes, but here are a few more details. 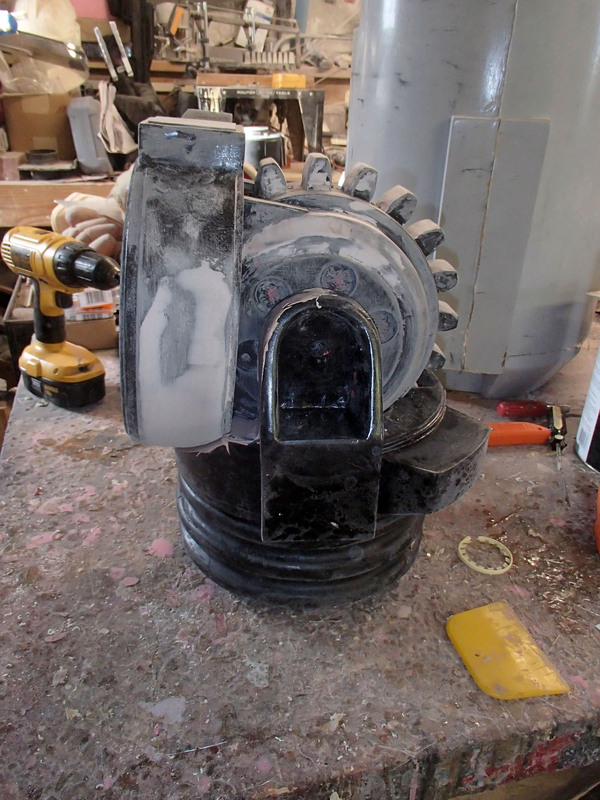 Rotocasting is ideal in situations where you have a large piece that needs to be hollow or lightweight, with finer details than you can get from vacforming. This is how I usually make wearable helmets or other armor parts. 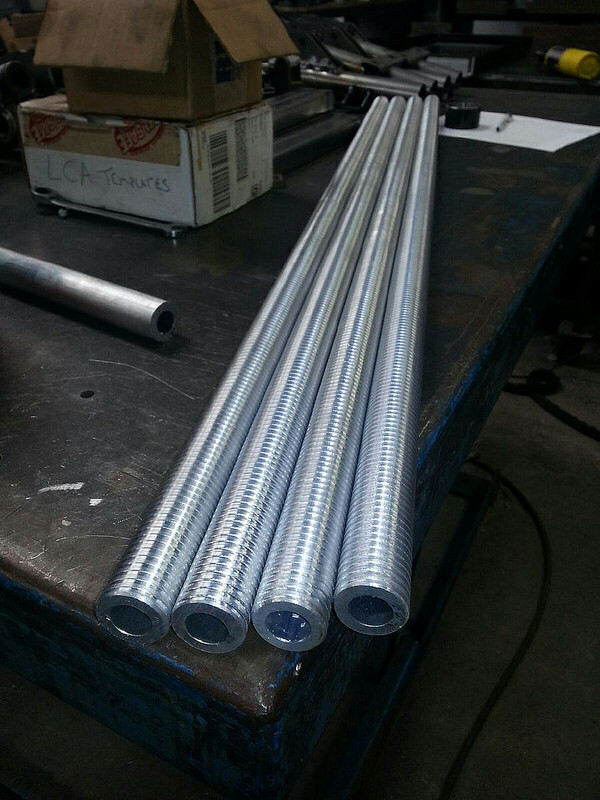 It’s also good for parts that have undercuts that would likely trap bubbles or the like. It’s a little more labor-intensive than simply casting a solid piece in a block mold, but you still get all of the detail replication of a silicone mold. 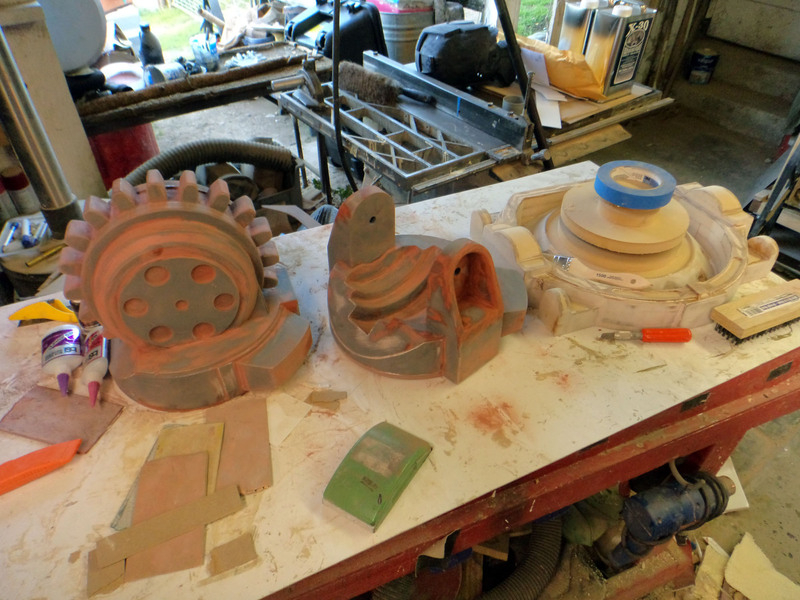 Making a mold for rotocasting is a bit more complex than making a silicone block mold. 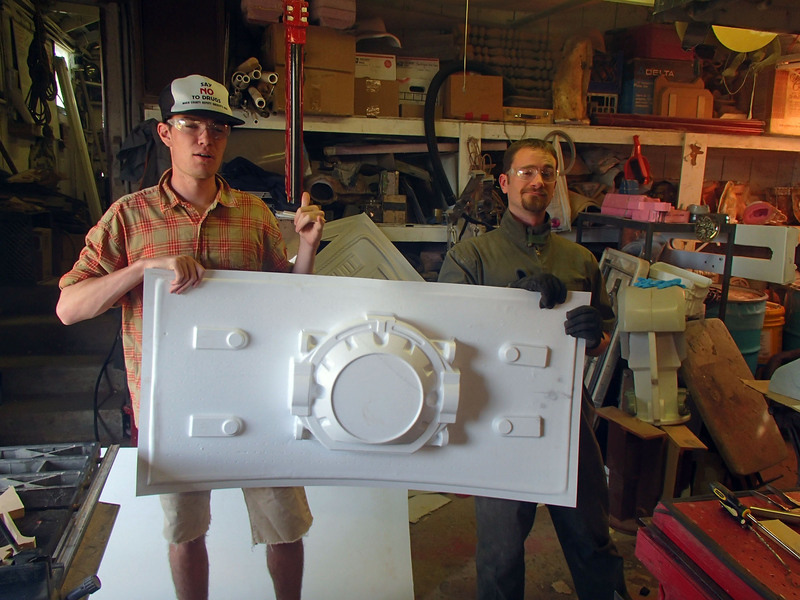 While block molds are fine for small parts, if you’re making a larger mold for rotocasting parts, a big silicone cube becomes impractically heavy and prohibitively expensive. 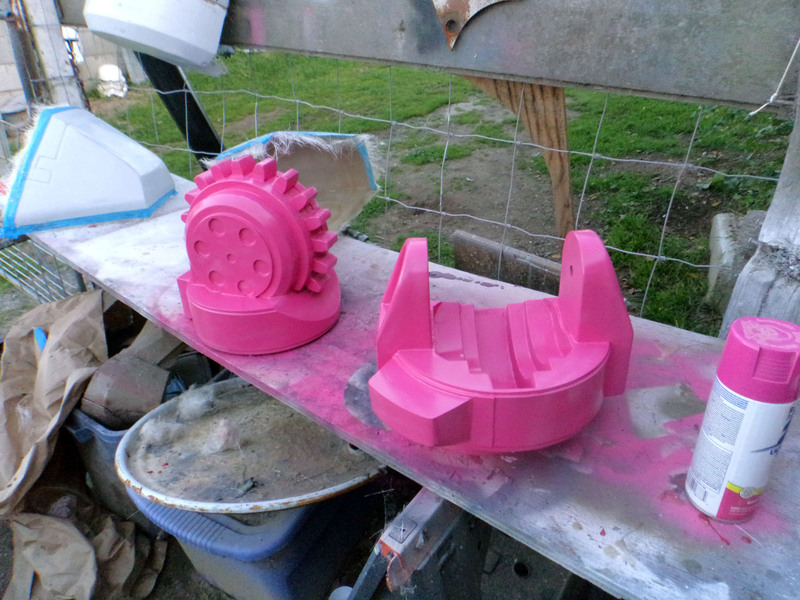 To demonstrate the process, I’ll be making molds of the two parts of the elbow joints. After a bit of sanding, priming, and filling, the elbow parts start to look pretty good. Lightish red gloss coat makes prototypes look fabulous. Print coat. That’s how it goes. Once the print coat has set and cured, the next step is to mix additional batches of silicone with a thixotropic additive that increases the viscosity of the silicone, so you can build up thickness on the vertical surfaces without it just flowing down onto the floor. Thickness built up on the inner elbow piece. Thickness built up on the outer elbow piece. 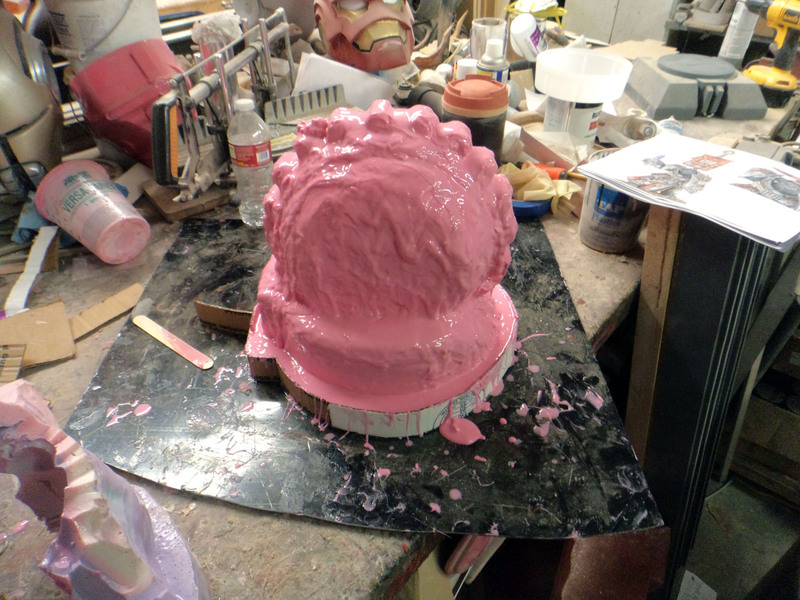 It may take a few layers, but you want to build up the silicone until it’s about 1/2″ thick over the entire part. More and you’re wasting costly silicone; less and the mold will be too flimsy and potentially collapse or bend in unfortunate ways. Once you’ve built up adequate thickness and the silicone has cured, it’s time to build a mothermold. 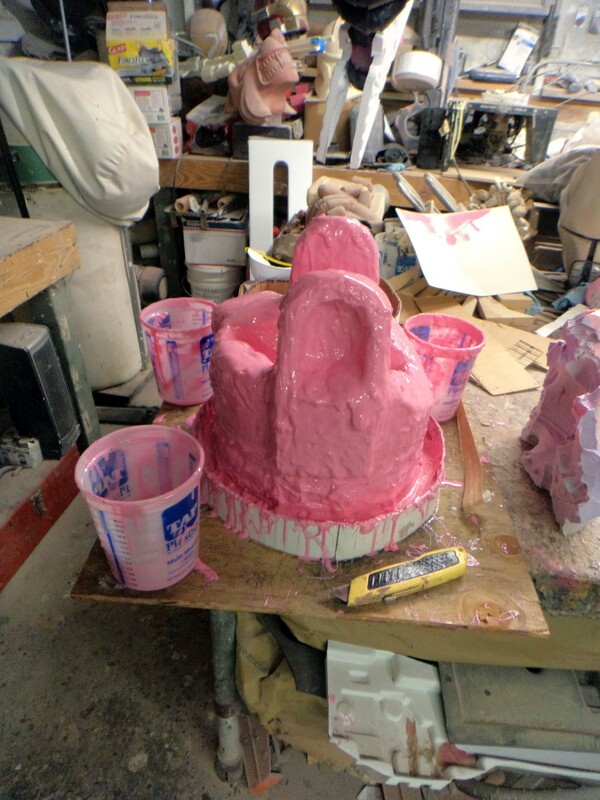 The mothermold is a rigid covering that will hold the silicone glove mold in the proper shape so it won’t collapse under its own weight during the casting process. 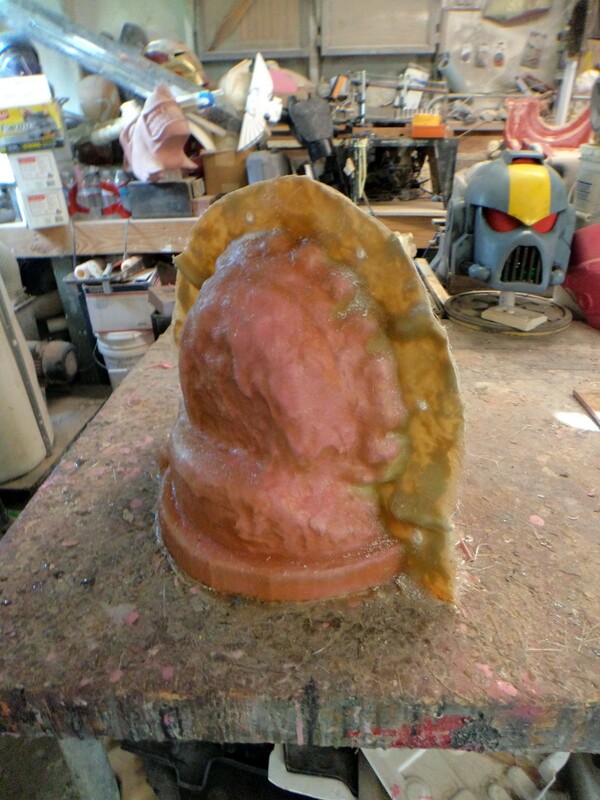 You can build the mothermold out of a variety of materials, including purpose-made urethane resin materials or even plaster bandages, but I tend to make mine out of fiberglass. This way they end up being durable and lightweight without being terribly expensive. Laying up fiberglass for the first half of the mothermold. First half of mothermold laid up. Then it’s time to turn the whole thing around, scrape off the clay wall, apply a release agent to keep the second half of the mothermold from bonding to the first half, and lay up fiberglass on the other side. Once the fiberglass has cured on the second half, you just need to drill holes so the two halves can be bolted back together, trim off all of the excess glassfibers, and pry the two halves apart. Finished mothermold for the inner piece of the elbow joint. 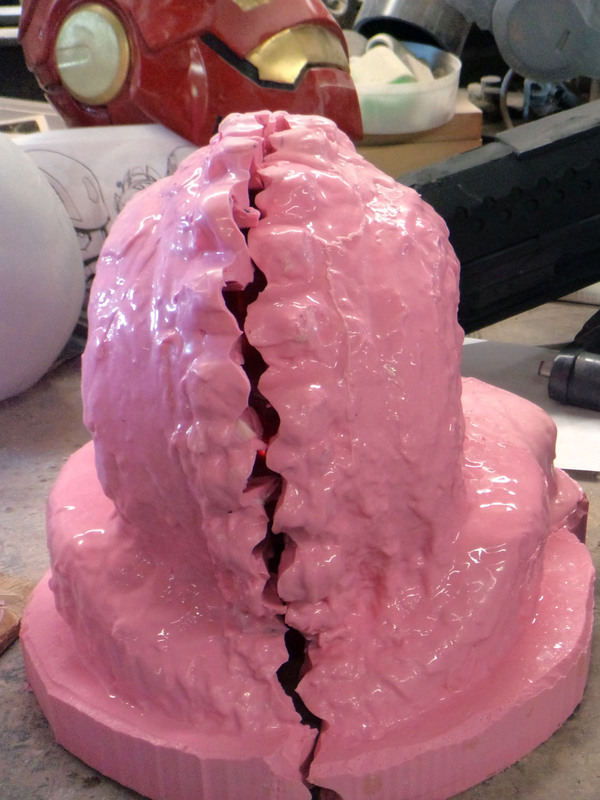 Since the mothermold for the outer elbow piece couldn’t easily be split into two pieces that would slip off without tearing the rubber jacket mold, I had to make it in three parts instead. One of these days I’ll make a fourteen-part mothermold. Just to show off. Once you’ve built the mothermold, it’s time to remove the prototype from the rubber jacket. If your prototype doesn’t have too much in the way of undercuts, you might be able to just peel the rubber off of it in much the same way as a rubber glove (hence the term “glove mold”). But if the rubber can’t stretch enough to easily remove the prototype, you’ll want to cut the mold to make it easier to peel off. It all looks like bubblegum, but don’t chew on it. 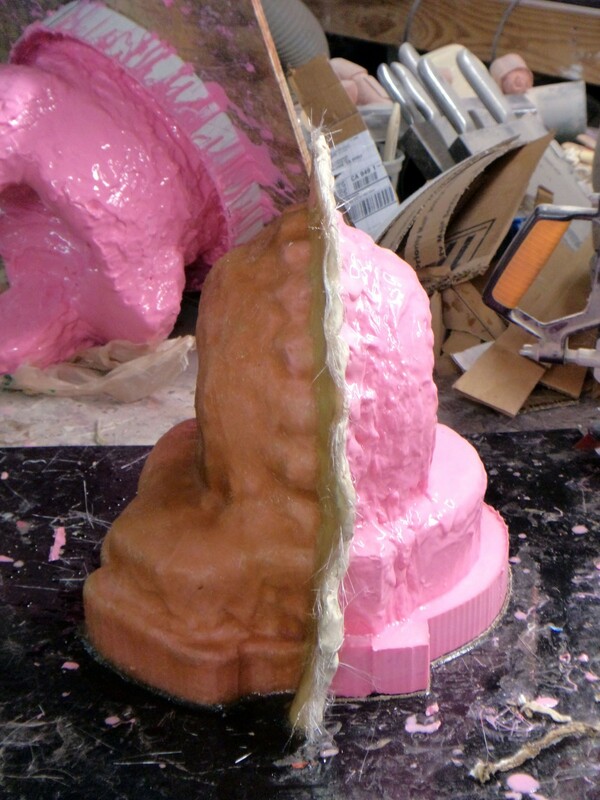 Once the prototype is removed from the mold, you put the rubber jacket mold into one half of the fiberglass mothermold, bolt the other half onto it, and look inside to make sure that the seam is aligned properly. Then it’s time to mix up some resin. 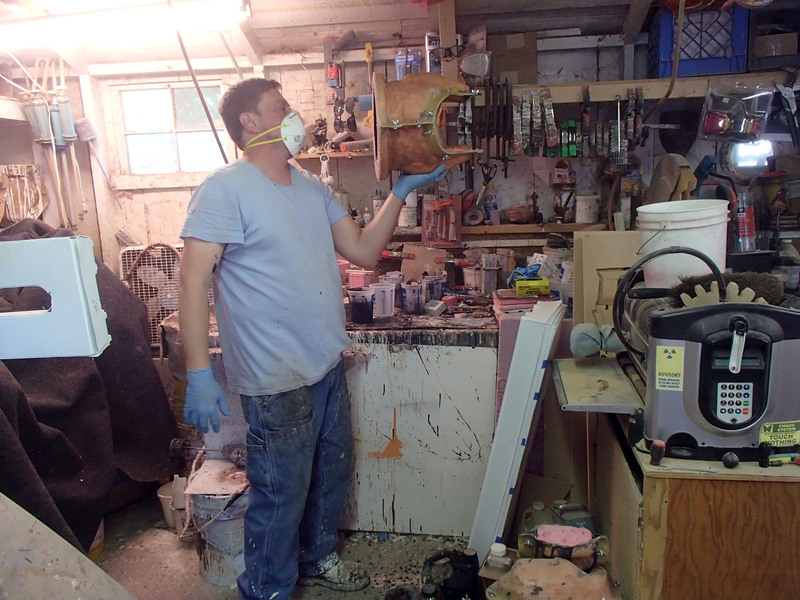 In order to make a hollow part, mix just enough resin to coat the inside of the mold. 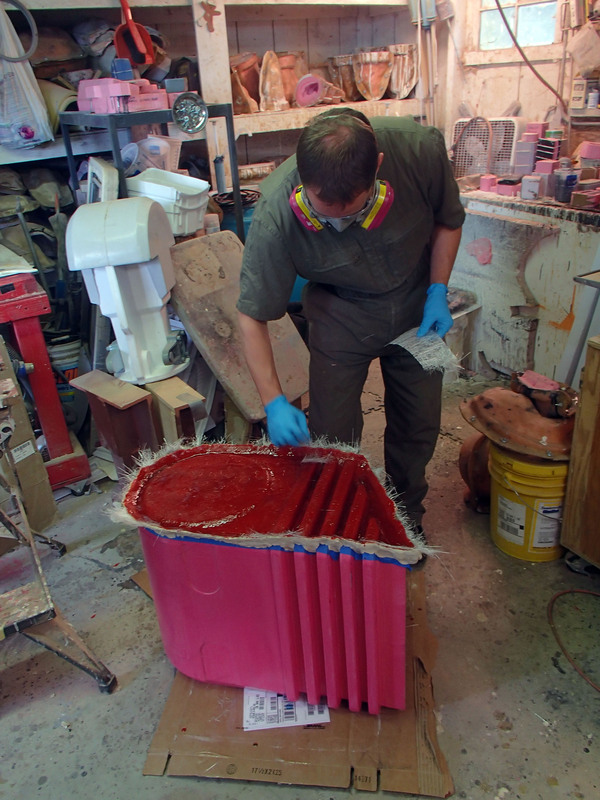 Then you pour it into the mold and, before it cures solid, roll the mold around to slosh the resin over every surface inside. You need to keep the mold moving to prevent the resin from flowing down to the lowest point and pooling, which would end up causing a thick spot in the finished piece. 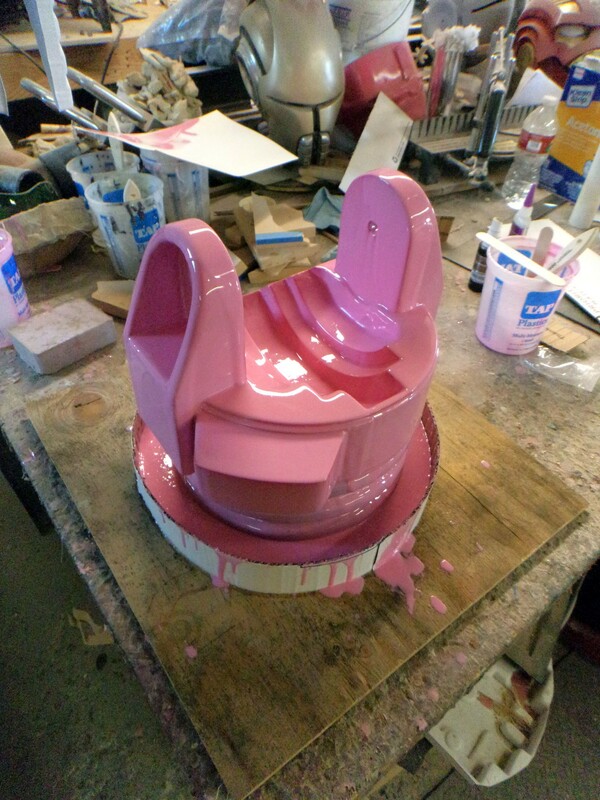 Once the first batch has cured to the point where it no longer flows when you rotate the mold, it’s time to mix up a second batch and add another coating to the inside of the mold. You can repeat this as many times as you like, until the cast part is thick enough and strong enough to serve whatever purpose you’ve got in mind for it. Credit where credit is due: he’s better at this than me because I usually try to rush it. Shiny black plastic robot elbows never looked so good. 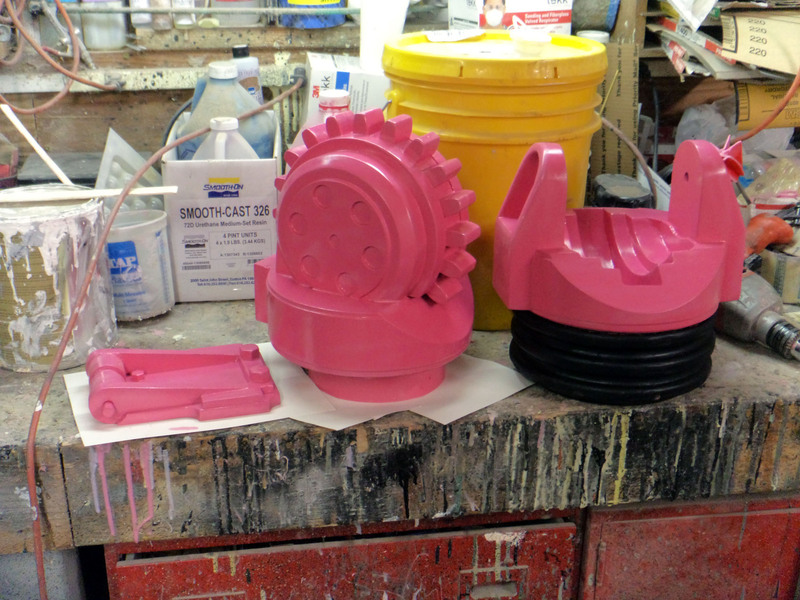 In this case, the parts are being rotocast in black urethane resin. If you’re new to this, it’s a good idea to use alternating colors for each layer of resin you pour in — that way you can easily tell if there’s a part of the mold that you haven’t coated yet. The mold for the inner elbow part didn’t come out nearly as clean as the mold for the outer elbow part, but after a bit of filler and sanding, they will be ready for paint. Body filler and paint will wash away all of your sins. Brian and Trevor showing off the first successfully vacformed armpit gimbal. 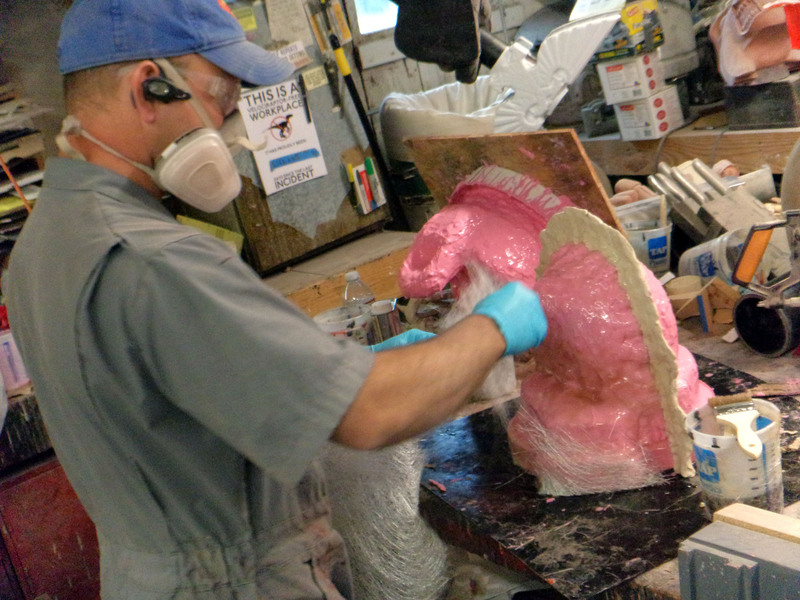 Trevor laying up gelcoat on the beginning of the pelvis mold. 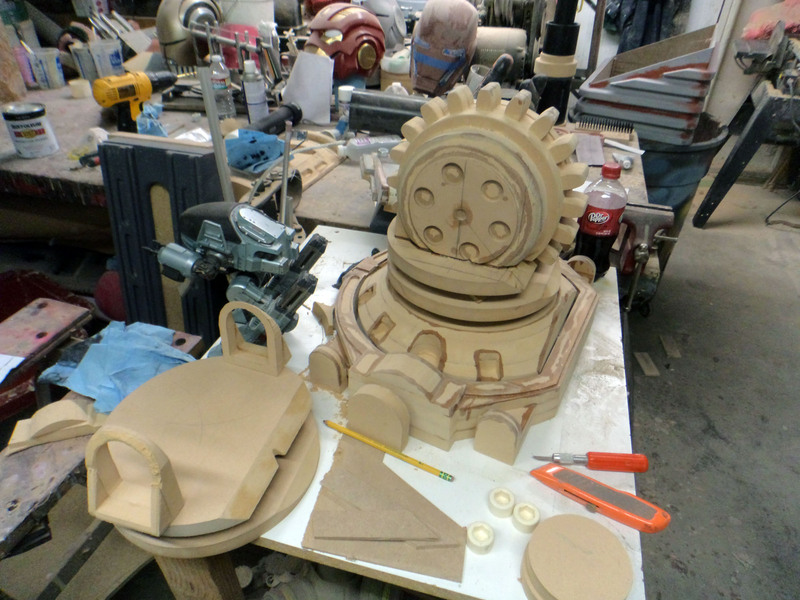 With only 18 days until I have to load the finished prop onto a truck, there’s still much to be done.